Category: WWVB, MSF, JJY-60, DCF77. 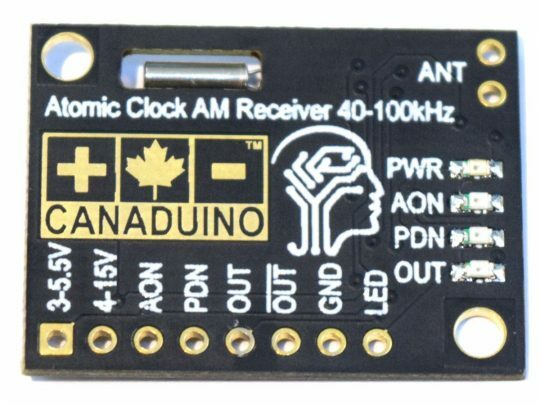 The new version of UNIVERSAL-SOLDER / CANADUINO atomic clock receiver module is the most advanced and best equipped AM Atomic Clock Receiver module available today..
We designed this product around the awesome receiver chip from Micro Analog Systems (Finland), just like the old module was. 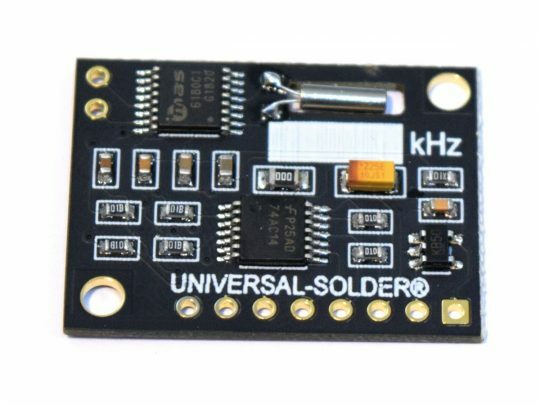 It means, this module is in particular designed for the use with micro controllers in an operating voltage range of 2 to 15V, and standard logic levels 3.3 and 5V. 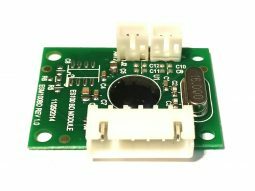 – We added an ultra quiet LDO voltage regulator, to offer a wide supply voltage range of up to 15V. 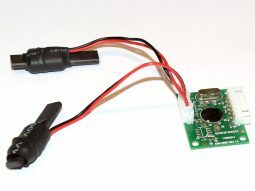 – We added 4 LEDs to show the status of power, AGC, power down mode, and output. 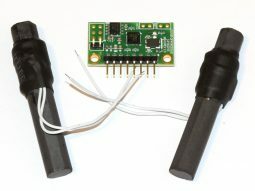 – We added drivers for the output signal, and an inverted output, both capable of driving up to 15mA. 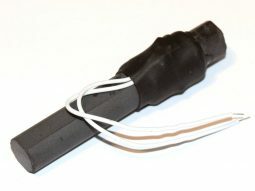 – We modified the antenna design for a better eception with an even shorter antenna stick. The new designed, fine tuned 77.5kHz antenna guarantees even better reception than the old model. 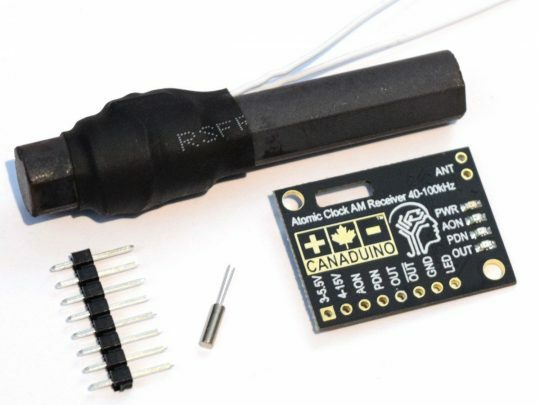 This module can be used to receive the atomic clock signal transmitted by DCF77, Germany. This kit needs some soldering. Crystal, antenna, and pin header are not assembled for a more flexible use. So is it possible to use a different crystal and different antenna, for example for a 40kHz setup for Japan, or a 60kHz setup for USA and Canada. If you don’t want to develop your own project, you can find many projects online, using 60kHz atomic clock receiver. 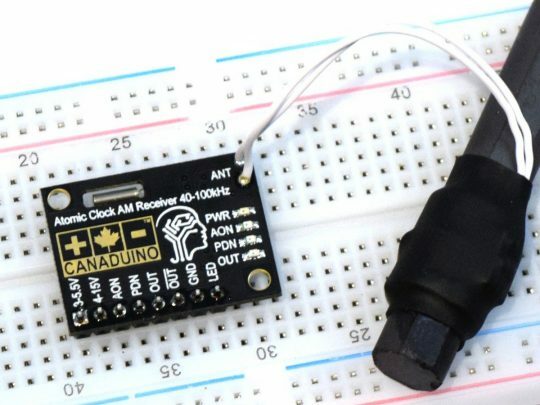 From Arduino data logger to Nixon tube clocks. There are also libraries for Arduino IDE and other development sources online. We highly recommend to read the official Wikipedia article about the DCF77 time signal. 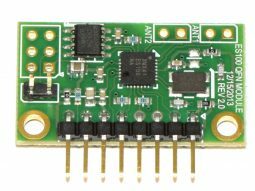 Download detailed data sheet for the MAS6180C receiver IC.